Maybe a post about brussels sprouts (or brussel sprouts, or brussels sprüts, however you want to spell it, I'll just switch back and forth) isn't the best time to talk about fantasies of super powers. I mean, most people would perhaps use a super power to avoid brussels sprouts. But don't we all have some kind of super power fantasy when we're little? Mine was very well thought out, during that half hour every night before sleep. Here it is. If I had a super power, it would be the ability to choose one quality from every person I meet that I would like to incorporate into myself. I'll explain. If I met, say, Cesar Millan, I'd be able to whisper with dogs. If I met a brilliant forensic anthropologist, I'd be as much a genius as Brennan (you know, from Bones? Don't you watch Bones? Whatever, Bones rules my little world). I wouldn't be stealing these qualities from people, they'd be able to keep them too. It's just that I could instantly be fluent in any language, brilliant at any instrument, a genius in any subject, the fastest runner, best swimmer, and most limber gymnast (well I guess technically it would be a tie between myself and whoever had the skill to begin with). I still fantasize sometimes. 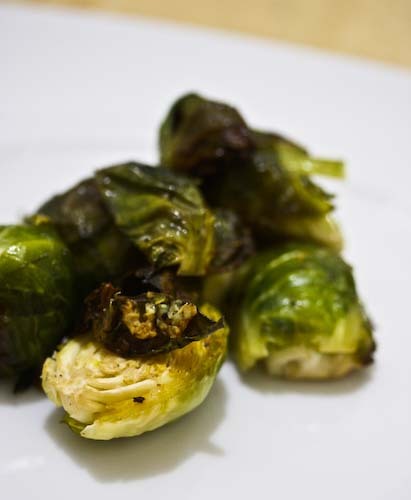 And maybe from Elise at Simply Recipes I'd take her skill with brussel sprouts. Except, of course, I don't have to because the recipe is simple and not beyond anyone's ability. Still, it accomplishes a major feat, since poor brussels sprouts are too often boiled to within an inch of their existence before being plopped down in front of some whiny complainer who doesn't want to eat boiled cabbage-mush. I have to admit that I like them even when they are mistreated. My dad is another story, and his complaining (did I just call my dad a whiny complainer about brussels sprouts? I think maybe yes.) successfully convinced my mother to serve them only on Thanksgiving. Only once a year, and he only had to eat one. I'm not sure the good roasting we're about to give them would convince him otherwise, he's pretty stubborn about things like that, but it sure does bring the nuttiness of the brussel sprout to the fore, which plays oh-so-nicely with the garlic and lemon juice. And I'm sure they'd get along famously with the Parmesan cheese I was kicking myself for forgetting. Unfortunately, I don't have any of those super powers, nor, it seems, the ability to maintain my 100% healthy streak through the winter. I'm sick, I don't feel like typing anymore, and so I'm going to send you over to Simply Recipes for your sprouts fix. Enjoy! I love roasted sprouts. So much better than boiled or steamed. A little salt on top and they are good. 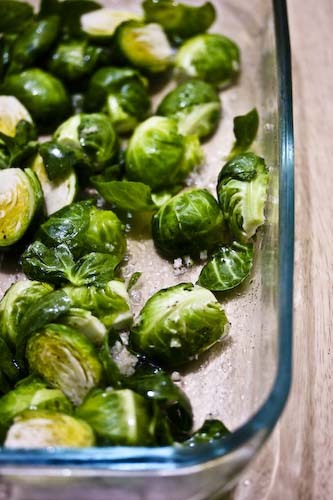 it's funny how these posts involve fathers....i remember grandpa chan growing his own brussels sprouts in his backyard and seeing him harvest them in the fall - beautiful tall plants and delicious! I make sprouts with roasted walnuts, orange and butter, and they rock! I have even managed to convert some non lovers this year. This is our standard brussels sprouts technique. My kids love them and I've even converted my wife!